I reckon we’re pretty good in the Bangers & Mash house when it comes to snacking healthily. Just as I sat down to write this post, my girls came in with their usual mid-afternoon demand: “Mummy, we’re hungry! Can we have a snack?” They are now happily munching their way through a bowlful each of dried apricots. Don’t get me wrong. We’re not food saints by any stretch of the imagination. We enjoy our potato crisps and chocolate biscuits as much as the next family, but these are clearly seen as occasional treats rather than everyday snacks. As well as dried apricots, the girls also love their dried apples, which we dry ourselves above the Aga – perfect in late summer when our apple tree is heaving. 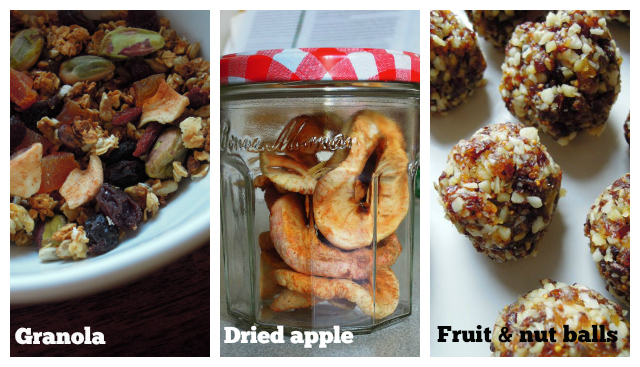 Dried apple is a perfect ingredient for our fruit & nut balls and granola, both of which make ideal snacks. Cherry tomatoes, chunks of cheese and cucumber, and carrot sticks are also snacktime favourites with my girls. But probably the snack the kids ask for most are dips and breadsticks. 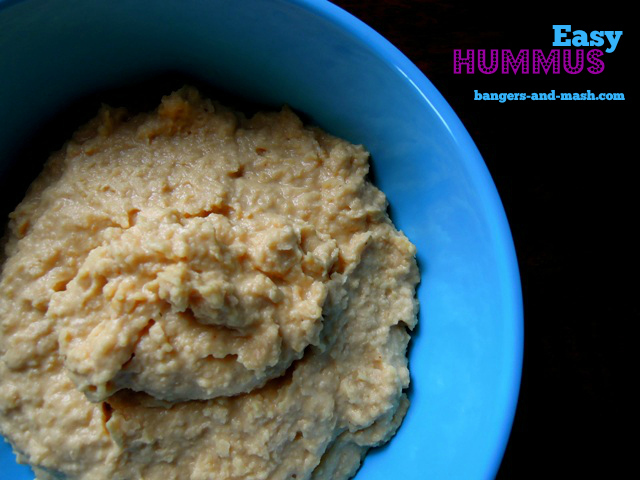 We always have a pot of chunky hummus or some other dip, such as this deliciously smoky aubergine puree, on the go in the fridge. I used to spend a fortune on the shop bought varieties, until I realised just how cheap and easy they are to make at home. And so much tastier too. Both recipes are based on ones I found in Leon cookbooks, but I’ve tweaked them slightly for my family’s tastes, in particular by increasing the amount of garlic involved in the proceedings. 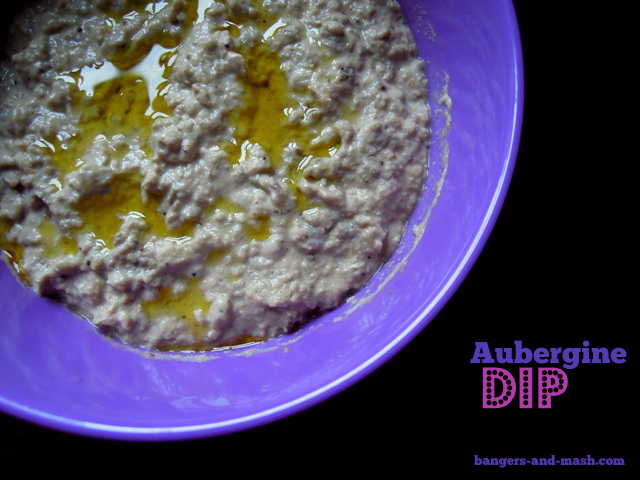 Use yoghurt instead of the tahini to turn this dip into babaganoush. Preheat the oven to 220°C / gas mark 7. Prick the aubergines with a fork and bake in the oven, direct on the rack, for around 20 minutes until the skins have blackened. Peel off the aubergine skins using a sharp knife while they are still warm. 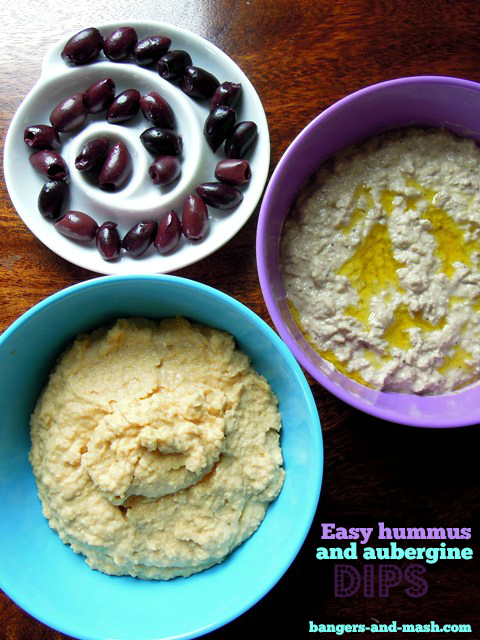 Whizz up the aubergines in a food processor, together with the tahini, lemon juice and garlic. Taste and season with salt. Pour into a large bowl to serve, drizzled with olive oil. Simply place the chickpeas, lemon juice, garlic, tahini and olive oil into a food processor and blitz until you reach a good consistency. I like mine fairly chunky but you might prefer yours smoother or looser. If it seems to dry, add a little more olive oil and/or lemon juice. Season to taste and pour into a bowl to serve. Sprinkle with a little paprika if you like. 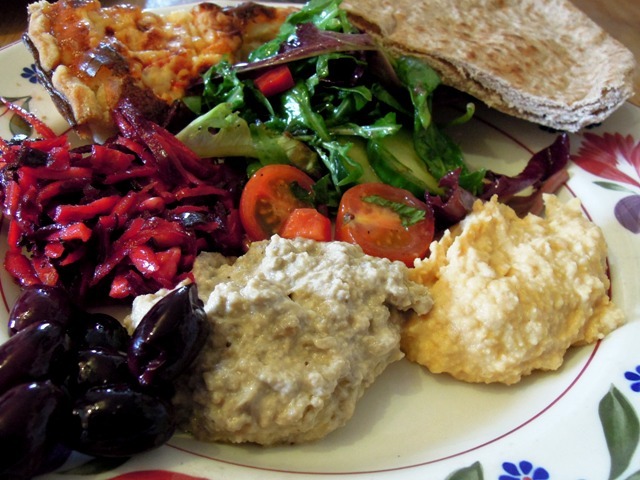 Why not serve your dips as part of a mezze? Easy peasy, lemon squeezy. As my children like to say. Both dips are a good accompaniment to crudités, breadsticks or warm pitta bread, or serve as part of a mezze. I’m entering these dips into April’s Family Foodies challenge, hosted this month by Louisa at Eat Your Veg. The theme this month is Healthy Snacks. Do pop over there to take a look through the other recipes entered so far – there are some really good ones this month. In particular, I’ve got my eye on the Easy Peasy Mackerel Pate from Casa Costello, which looks delicious and wonderfully simple to make. Two of my favourite dips right there. Nice work my friend. Ha ha, you put an extra clove of garlic in your hummus than me, go girl! The amount of times I make a quickie bowl of hummus first thing in the morning then realise I’m stinking on the school run, eh well. And I can’t believe I’ve not thought of using tahini instead of yoghurt to make a more ‘hummusy’ variation of babaganouch. So going to make! A great Family Foodies ‘Healthy Snacks’ entry Vanesther.